I know I haven’t posted a blog post in a while and I’m sorry about that – for whoever actually reads my blog lol. Anyways, when I start physical therapy school I should theoretically be able to have more posts and topics to blog about. So hopefully it plays out like that. Anyways…. 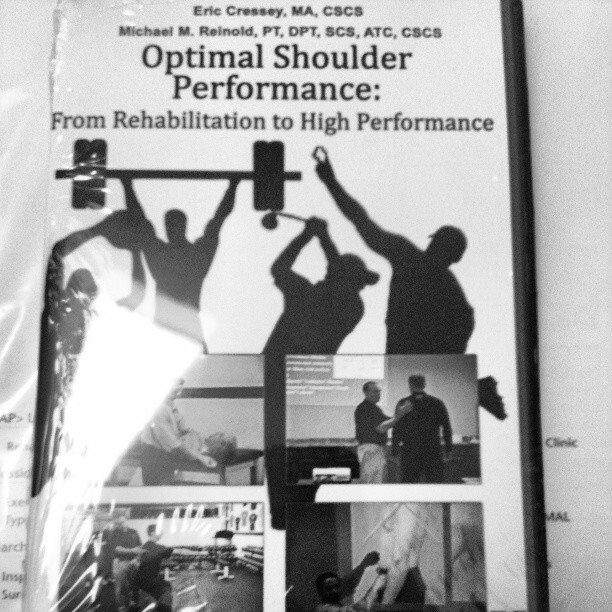 So this afternoon I just finished watching the four disc set of the Optimal Shoulder Performance and I have to say it was one of the most enjoyable learning experiences I’ve had so far. Whether you are a personal trainer, strength coach, a physical therapist, athletic trainer or medical professional, everyone can take something away from this presentation. Although the main focus is on the sport of baseball, most of the information presented by both speakers can be applied to any patient, client or athlete with overhead activities. Here’s are some sample clips from the DVD set. Although I haven’t started Physical Therapy school yet and I’m pretty new at the strength and conditioning field, I definitely feel that I took at least my 2% (quote from Eric Cressey on his latest presentation about training the anterior core, which I really liked) out of the presentation that I could use immediately into my training. Eric and Mike are able to easily explain common injuries to the shoulder joint, how to asses the different injuries and what exercises to use for shoulder rehabilitation. It was easy for a novice like me to understand which will definitely help in the future when I see this material again. This is hands down a great resource to have whether you’re training or rehabing people – which Charlie Weingroff considers one in the same (Rehab = Training). This isn’t just all talk and PowerPoint either. You won’t be bored by monotone speakers just talking while watching a side-show. Mike and Eric first go through a lecture portion then eventually in the later DVD’s, have a lab section which demo what they discussed in the former lecture sections. Although recorded, you feel like you’re there and you really do get a lot out of the “hands on” section – well at least I did. Seeing the actual techniques and how to cue people into proper position is really important. Fortunately for me, I was able to pick up my old undergraduate job as a student assistant in the athletic training room. So hopefully I can pitch some of what I learned from the presentation to the athletic trainers and convince them to implement the knowledge I learned into the strength and rehab programs that the overhead athletes currently use. I highly recommend in picking up the Optimal Shoulder Performance set if you’re even thinking it. It makes for a valuable learning resource and something that you can take from instantly and use within your scope of practice no matter how experienced you are. If you’re still interested in picking up the DVD set, pick up a copy on their website here. I was fortunate to pick up a copy when it was 33% off the regular price of $127 – which I think is a fair price either way for the knowledge you’re getting from two very smart and reputable people in their respective fields. So what are you waiting for?! Go pick up a copy – you won’t regret it. On another note, I’m still watching Muscle Imbalances Revealed and Training = Rehab, so once I get through those, maybe I’ll post another blog on those about what I think about them.